The most common use of magnetic fields has long been for the treatment of arthritis, rheumatism, fibromyalgia, back pain, headaches, joint sprains & strains, tendonitis and more. We believe by resting on Magne-Sleep each night you will enjoy less pain & much more sleep. Cotton Quilted Magne-Sleep has the same magnetic structure as our Zip Off Lambswool Magne-Sleep so you can expect the same results. Place Magne-Sleep close to your body, directly under the bottom sheet, for the best results. You can safely fit your electric blanket underneath Magne-Sleep. Scroll down for detail. 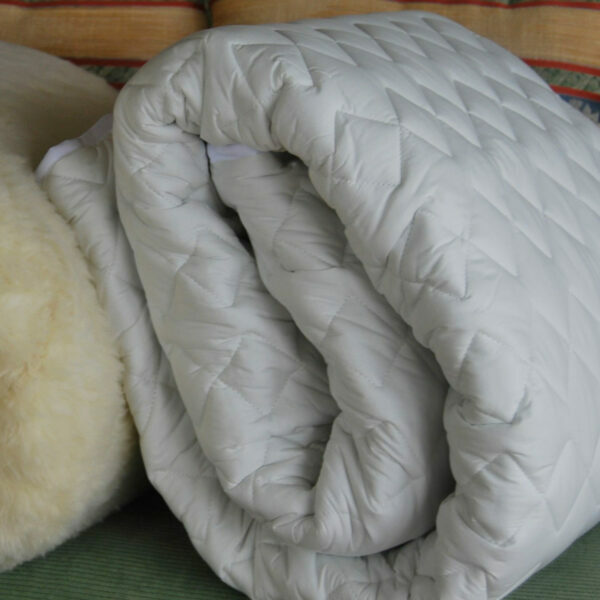 The included Magnetic Pillow Pads are finished with Pure Cotton Quilt for ideal cool head rest. Use inside your pillow case to treat neck stiffness, shoulder soreness, migraine pain, tinnitus discomfit & sleep problems. Great Bonus products included with every Magne-Sleep Purchase! Single,K.Single Include: 1 x Magne-Pillow Pad, 1 x pr Magnetic Shoe Inserts. All Other Sizes Include: 2 x Magne-Pillow Pads 2 x pr Magnetic Shoe Inserts. Pure Cotton Quilted Magne-Sleep has the same magnetic structure as Lambswool Magne-Sleep, so you can expect the same great results. Magnet Detail: We use large 25mm x 3mm 1000 gauss (surface strength) strontium ferrite magnets set in a continuous “North Seeking” grid pattern. Mattress Fit: Quality elastic straps give a secure mattress fit and the Magnetic Inner is deep 300gsm for ideal cushioned, comfort. For the best results place Magne-Sleep close to your body, directly under the bottom sheet. You can safely fit your electric blanket underneath Magne-Sleep. The Pillow Pads: The included Magnetic Pillow Pads are Pure Cotton for cool head rest. Our Magne-Pads may help relieve neck stiffness, shoulder soreness, migraine pain, tinnitus discomfit and may encourage better sleep. Use also away from your bed on your armchair or as a travel pad. Cleaning: Unless you have a large front loader washing machine (i.e.no agitator) we recommend you use a bath to launder Cotton Magne-Sleep. Soak your underlay in cool bath water, with added suds. Drain and refill bath with cool water. Soak again, then drain to remove excess water. Hang to dry outdoors on a dry, breezy day. Do not dry-clean, nor use a drier. Free-phone 0800 766 737 if you would like help with cleaning. Magnet Detail: We prefer to use a larger magnet they sit flat and stable on the mattress and give better body penetration. All our magnets are 25mm x 3mm 1000gauss (Surface Strength) Ceramic Strontium Ferrite (North Facing) set in a continuous grid pattern. Magnet life is 10 – 15 year, gradually reducing in strength. CAUTION: Please note that pregnant women and people with electronic implants (pacemakers, insulin pumps etc) should consult a Health Professional before using magnetic health products. We suggest you do not wear a watch when resting on your Magne-Sleep Magnetic Underlay.